paul gregutt's washington wine blog – unfined & unfiltered: an experiment - which is best - zinfandel young, old, or in-between? an experiment - which is best - zinfandel young, old, or in-between? A weekend with good friends provided the opportunity to do some deep level research on that thought-provoking question. A visiting couple from Seattle were in town to celebrate their wedding anniversary; another couple were finalizing the purchase of a new home here in the Burg; and Mrs. G and I were enjoying the first barbeque on our just-finished patio. A splendid occasion all around. Zinfandel was the order of the day, given the barbecue we had going, and my Seattle friends had brought the 2001 Rafanelli and the 2006 Nalle Reserve with them to jumpstart the tasting. We rambled back into my cellar and pulled out the other four wines, which included a 1977 Sonoma Vineyards River West Old Vines, a Pezzi King 1997 SLR, a 2001 Trinitas, and a 2011 Sineann Old Vine. 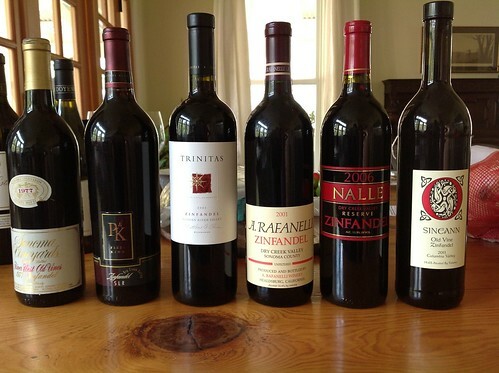 All together, these six bottles spanned 35 vintages of Zinfandel. How does it age? What would be the “sweet spot”? Which would be the most complex? Which the highest in alcohol? Which would be the last bottle to be finished, and why? These were all questions we hoped to answer, in an evening-long quest to determine which Zin would be crowned Best of Show. The wines did not disappoint. In fact, this turned out to be one of the most interesting and surprising tastings of the entire summer. Let me make it clear that this was in no sense a blind tasting. We all knew what the wines were, tasted them from unconcealed bottles, and in no particular order. Here are some notes, going backwards in time from youngest to oldest. The 2011 Sineann, though not quite a year old, drank very well. A cool vintage in the Northwest, it kept the alcohol below 15%, and the old vines always ensure that yields will be low. Spicy and crisp, it was tasted in small pours over many hours, so as to give the wine time to blossom, and it was very well liked. The Nalle – a 2006 Reserve – was simply outstanding. I had never seen or tasted a Nalle reserve, though I used to collect these wines and had many a fine bottle back in the 90s. This wine was elegant, yet powerful, with classic, Claret-like character. Also very well liked. The Rafanelli showed aromas of brett right out of the bottle, and that vaguely horsey scent and flavor carried through the wine. That said, and even though it was 10 years old, the wine still had quite a bit of fruit left in it, and was certainly not in any way undrinkable. Yet that touch of brett didn’t sit well with our tasters, and it was the only bottle that was not drained dry by the end of the night. The Trinitas was from my cellar, given to me by winemaker Matt Cline at a luncheon some years ago when he was introducing the brand. It was the sleeper of the lineup. In the excitement over the better-known wines it attracted little attention until we’d done some damage to the others. But coming back to it then, it showed itself to be in perfect condition, with excellent balance and fruit that was rounding out into secondary flavors, though still with much life ahead. The Pezzi King was also a bottle I’d had in my cellar since it was released. It had survived the years (and travels) in fine shape. Definitely drinking like an older wine, it was probably at its peak. Tannins were soft and flavors a bit muted, subtle, and perfectly integrated. A very nice bottle, and at 15 years of age in excellent condition. Which brings me to the wine of the night. To my astonishment (and everyone else’s delight), the Sonoma Vineyards wine was absolutely gorgeous. It took a very gentle touch to get the cork out, which broke and threatened to turn into powder, but ultimately came out of the bottle (in small pieces) with just a crumb or two making it into the wine. Thick black gunk lined the bottle's neck and sides; I did not decant it because I was afraid that even a little extra exposure to air would shorten its fragile little life. Hah! Was I ever wrong about that. Granted, with wines this old, there is no guarantee how long they will hold up once the cork is pulled. Could be 15 minutes, could be an hour, could be more. You want to dive in right away, and get a good snoot full of aroma and a decent mouthful of taste. That's what we did, and with six people sharing, pours were small. But the wine was generous! It turned out to be a wine that changed constantly over the course of more than an hour. A long roll call of dried fruits, baking spices, pastry notes, chocolate and more kept us all intrigued. It seemed as if it was a new wine with every sip. In the end it resembled nothing so much as a fine old tawny Port, though without the heat of the brandy. Surprisingly, this was the highest alcohol wine of the night as well, listed at 14.9%. The back label, written by winemaker Rodney Strong, noted that it came from a small block of vines over 65 years old (this was in 1977! ); and was aged in oak for 18 months prior to release. No prediction was made as to its aging potential, but I would be surprised if “Drink in 2012 for Maximum Enjoyment” was in anyone’s thoughts. But there it was. A glorious bottle! Great post, Paul! I am a big Zin fan, and have usually drank my Zin relatively young, within 5 years of the vintage. While I found that most of my Cab needed ageing, the Zin for the most part did not. Only twice do I remember letting a Zin go longer than 5 years: 1997 Ridge Lytton Springs and 1997 Fife Lots of Spots. The Ridge conitnued to improve, and while the Fife did not get over the hill, to my tastes it showed a little better in its youth. I guess my take-away is that Zin is pretty versatile and can be enjoyed at many ages.